No matter the condition of your fireplace, wood stove, or other chimney-connected appliance, if you don’t understand how your system works, it will be difficult getting it to perform in a way that optimizes both performance and safety. When trying to light a fire it’s important to remember that your entire house works as a system. For example, you could have a sparkling new home with a fireplace you could eat out of, but if you don’t understand some basic concepts of thermal dynamics, your first fire could send smoke spilling out into your living room and not up your chimney as intended. Sufficient draft has not been established — basically, what this means is that the air inside the flue is too cold and heavy for the smoke to push up and out of the chimney. This is a pretty easy fix: grab some newspaper and twist it into a torch, light one end and hold it up as high as you can reach inside the fireplace. You will know that sufficient draft has been established once you see the smoke and flame being pulled up towards the chimney. Once that happens, go ahead and light your fire. There is too much negative pressure in the house. Are you running a whole-house fan or an exhaust fan in the kitchen or bathroom? Either of these appliances can make establishing an effective draft difficult, especially if your home is relatively new (newer homes tend to be more tightly sealed than older homes). Don’t risk a fire or carbon monoxide poisoning call the experts US Chimney or visit our website at uschimney.com for an inspection of your chimney system or a new stainless steel chimney liner to ensure that your chimney system is clean and safe. In order to prevent any potential fire hazards, it is important to have your chimney inspected annually. Some people believe they can perform this service themselves, however, this is not the case. Certified technicians are trained to catch safety hazards, code violations and other potential future problems that your average homeowner simply doesn’t have the knowledge and expertise to recognize. A level 1 inspection, which is primarily a visual inspection of the exposed components of the chimney system. Should there be an issue after the level 1, then a level 2 inspection would be needed. This consists of sending a specialized camera down your chimney and taking video and still images of the interior, giving a more in depth look at any potential problems. Finally, if there is a major event such as an earthquake, tornado or chimney fire, a level 3 inspection is done. This basically consists of levels 1 and 2, in addition to an inspection of the interior venting components, which usually requires removing the chimney walls to access the damage. Level 1 inspections are recommended annually, regardless of how frequently you use your chimney. Level 2 is recommended when there may be a problem after the level 1 inspection, in addition to when you are selling your home. Level 3, again, is only to be done if there was a major catastrophic event. If you haven’t had your annual level 1 inspection done, please be sure to contact a certified expert such as US Chimney to ensure the safety of your home and family. Fall chimney maintenance and proper cleaning are key steps to keeping your family safe and warm as the temperatures drop. Neglected chimneys accumulate creosote, a combustible byproduct of charred wood, along their walls. Add to that a high internal flue temperature and you’ve got a potentially dangerous chimney fire on your hands. The best way to avoid a house fire caused by the fireplace or chimney is to hire US chimney sweep to inspect for cracks and loose bricks. We can also clean your chimney. 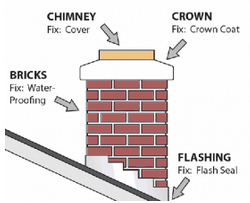 Chimney inspections are typically broken down into three categories. Level 1 is a standard, annual inspection for chimneys that have no major changes to investigate. 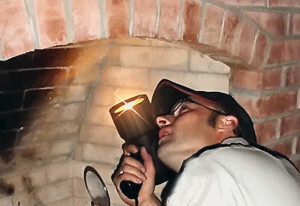 The chimney inspector will examine the interior and exterior, as well as the chimney connection. The general soundness of the chimney will be examined, and any obstructions will be noted. 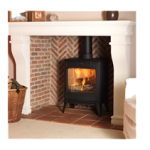 Level 2 is an inspection that follows a change in fuel type or changes to the shape or materials in the flue. Level 3 is rare. These inspections are conducted when a hazard is suspected. Typically, part of the building or chimney is removed to examine the chimney thoroughly. • Keep the area in front of the fireplace clear of paper and debris. It can be tempting during the holidays to place decorations close to the fireplace, but keep them at a safe distance. • If your fireplace doesn’t have a glass door, use a wire mesh screen. • Use seasoned hardwoods that have been split for six months to a year. “Green” wood creates more creosote. Don’t burn your Christmas tree (pine creates more creosote) or be tempted to throw wrapping paper, boxes, or trash into the fireplace. • Keep the area near the chimney clear. If you have trees that hang over the house near the chimney, make sure branches and leaves are at least 15 feet away. • Cap your chimney. A top that has wire mesh along the sides will keep out rain and snow, birds, and other critters that might be running around on the roof. • Think small. If you try to burn too much wood, the chimney can crack and you run the risk of creosote build-up. Burn wood on a grate placed near the back of the fireplace. Like fire, carbon monoxide can be a deadly threat. Carbon monoxide is an odorless, invisible toxic gas that kills about 400 people per year, according to the Centers for Disease Control and Prevention, and sickens many more. While carbon monoxide poisoning can result from poorly functioning home appliances and heating systems, it can also come from poorly maintained chimneys. The chimney and chimney connector serve as a furnace’s exhaust system. If debris is blocking the chimney, carbon monoxide can accumulate inside the house.Perhaps the most important rule of all when it comes to fall chimney maintenance is to install and maintain smoke and carbon monoxide detectors inside and outside of bedrooms. Replace the batteries each season and test the detectors regularly. If the detector is more than 10 years old, replace it. One thing most people don’t think about in the summer is getting their chimney cleaned. It just doesn’t seem to be that important among vacation time and keeping the kids busy. However, it is the best time of the year to get this chore done and out of the way and here are three reasons why. 1. No wait time, you are first in line to have your chimney swept. 3. Sweeping early reduces odors. The take away is there are some very good reasons to get your chimney cleaned during the summer months. Why don’t you make that call and just get this one chore out of the way right now. Summer is the time of year when we get the heaviest rain storms. A costly flood can be preventable if minor cracks or repairs are caught early enough. Timing a chimney sweep for summer will help ensure you can beat the rush on chimney sweep services that can occur during the first cold snap of fall. It may become more difficult to schedule a timely chimney service once every home on your street decides they need one at the same time. Why Should I Get My Chimney Swept? Getting your chimney routinely swept is important because a layer of smoke residue called creosote begins to build up on the surfaces inside your chimney as you burn wood in the fireplace. Creosote is highly flammable and can cause a full-out chimney fire if too much of it builds up in your chimney. Having your chimney swept regularly can also extend the life of your flue system. Since creosote and soot contain corrosive chemicals, they can combine with moisture buildup to prematurely corrode your flue system. Routine chimney sweeps can help mitigate this risk. Tax season is officially over! Who’d like to get a brand new, gorgeous, weather-resistant, long-lasting chimney with their tax refund money? Are you unknowingly harming your family? 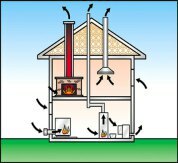 The smoke that your solid fuel appliance produces is full of harmful particles, including volatile organic compounds and carcinogenic. Smoke can foul up the air both inside and out, and exposure to the stuff can cause serious respiratory problems. 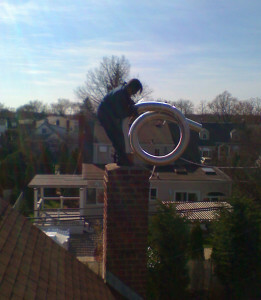 Always use a trained and certified chimney sweep such as US Chimney to keep your home and family safe. We are trained and certified with full insurance for your protection. 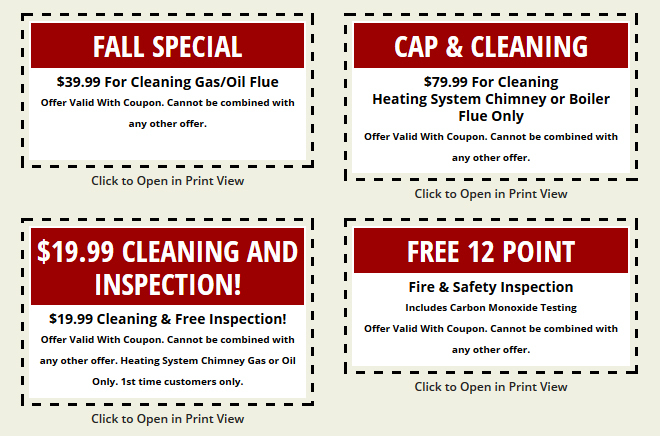 Now is the time of year to secure your chimney for the next season! One of the most common questions we get is: How often should I have my chimney cleaned? The quick answer is every year. The National Fire Protection Association Standards say you should have your chimney, fireplaces and vents inspected once a year. 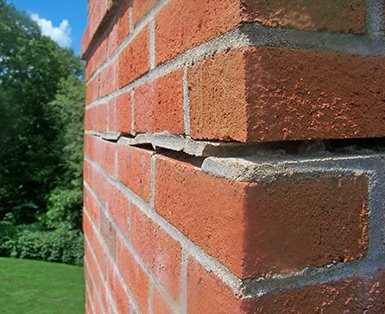 The Chimney Safety Institute of America (CSIA) recommends that open masonry fireplaces should be swept once they have ⅛” of sooty buildup or sooner if there is glaze in the system. Another theory is to clean your chimney after every two cords of wood. We at US Chimney recommend annually. Just because you don’t use your fireplace or stove very much, an annual chimney inspection gives you professional insight into all your heating systems, venting systems, chimneys, stoves and furnace flue. This inspection provides you peace of mind toward the safety of your home for the winter months. As a homeowner, you might not be able to identify whether you have a ⅛” buildup, but you surely know when the season has turned and it is time to bring in your chimney sweep to inspect and possibly clean your chimney, fireplace and/or stove. If you are burning wood as your sole source of heat, you might consider a mid season chimney cleaning after you’ve burned two cords of wood. Contact Us Today! Prevent Chimney Fires with US Chimney! A recent house fire in our area was caused by flames igniting creosote, a residue in the smoke of burning wood, coating the flue. This fire could have been prevented. 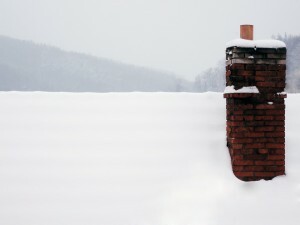 Keep your family safe this winter and call US Chimney so you do not become another statistic! A firemen on scene had the following to say “I strongly suggest an inspection with a camera,” Patterson said. “The best bet is having a metal liner in the chimney so we don’t have to worry about mortar going bad.” Contact US Chimney today. A fire feeds off heat, fuel and oxygen. Chimneys coated with as little as 1/8-inch of creosote give flames ample fuel. Before you burn wood in your fire place you should have your fire place inspected by a company like US Chimney Corp. We can inspect your fireplace and chimney and ensure you are burning wood as efficiently and safely, as possible. Contact Us for more info. 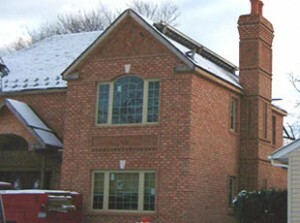 Why you need a functional chimney cap this time of year. 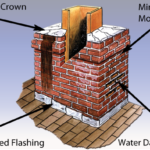 A chimney cap will keep rain water from coming down your home’s chimney. Rain water can damage chimneys with stainless steel liners, chimney dampers and chimney mortar joints. Beyond the damage from the water itself, moisture from rain water can produce mold and mildew. 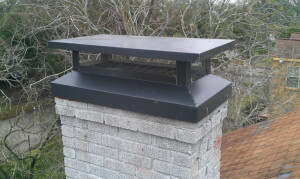 We Do Chimney Cap Installations. 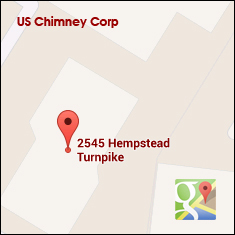 Did you now US Chimney has an A+ Rating with the BBB and we are on Angies List. It’s not hard to picture that. Chimneys without covers get a lot of rain falling straight down into them. A chimney cover makes sense to most people. Not only does it keep the rain out, but keeps birds, animals and debris out. The greatest value of the chimney cover is really keeping these out because when chimneys get blocked at the bottom, people get sick (or even die) from CO poisoning. The chimney crown is the cement part on top of the chimney. The bricks go up around the tile flue liners, but at the top you need something to stop the rain and snow from just falling in around the tiles. You can see that the very purpose of the chimney crown is to keep rain out. . When your crown has cracks, the water goes right through those cracks. Find Out More About Chimney Cleaning. Gas fumes are very low temperature and have a lot of moisture in them. These fumes were condensing on the inside of this too-large, too-cold old chimney, literally soaking the bricks and keeping them moist all the time. All it took was a chimney liner and we solved the problem. The flashing is what keeps water from going into the place where the brick structure comes through the roof (or otherwise comes close to the roof.) There’s a fairly large gap between the bricks and the roof and water will pour through that hole if it’s not sealed up. Flashing is often aluminum that goes in between a couple bricks and bends to go on top of the shingles. Some sort of water proof “stuff” seals those spots. Though it’s far from the best choice, the “stuff” is often tar.